FireDino's have returned from what they described as an absolutely wonderful Spring Break (they insisted that we let them out of the office for a couple of weeks), but they are now back in their boxes and ready to get back to the business of routing your FireWire devices here and there and generally cleaning up the clutter of cables and drives on your desktop. Don't worry - a week or two in the sun and surf hasn't knocked the edge off of their fiery personalities. These FireDino's are still the fiercest 4-port FireWire breathing hubs on the planet and what Spring Break taught them is that they love to travel! That said, they have given us permission to lower their price $5 for the next couple of weeks in order to allow them to see more of the country and eventually find homes throughout the world. Charismac's FireDino's will be available for $69.95 through May 9th or until they are sold out once again. WiebeTech announces a sale price on the popular high performance MicroGB+40EX pocket drive, which features dual FireWire interfaces. From now until May 10, the highest performance 40 GB configuration of MicroGB+ has been reduced by $80, from $319.95 to $239.95. This configuration features a 40 GB 5400 RPM drive along with a 16 MB cache, the highest amount available in a notebook drive. "We think users will appreciate the performance and value of MicroGB+ in this configuration," said James Wiebe, CEO of WiebeTech. "This is a special value which will continue only through May 10." The MicroGB+40EX is bundled with MacDrive 5™ software, a $59.95 value, at no additional charge and also comes with an attractive carrying case. In the U.S. and Canada, dealers may purchase any configuration of MicroGB+ from WiebeTech's distributor, Dr. Bott LLC or from dealers. All configurations are in stock and available directly from WiebeTech. Canadian resellers may purchase products from EMJ. 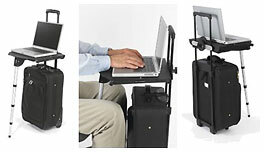 Desk Space Anyplace quickly converts your rolling luggage, rolling computer case, or luggage cart into off&endash;your&endash;lap work space you can use to "office" anyplace. This unique laptop desk adds convenient portable laptop desk space to your rolling luggage anyplace - and works on wheeled computer cases and luggage carts as well. It folds up to pack, and travels easily inside your rolling luggage, case, or cart. Or carry it securely outside, hanging within its own optional carrying bag. It's also ergonomically adjustable to your personal seated height. Six inches of vertical height adjustment ensure that this desk will accommodate virtually everyone. Or use it standing up, in those long airport security check-in lines, while waiting at your gate, when using the public phones, or if seating is scarce. Its nonskid top is extra wide for those big laptop computers and messy on-the-road paperwork tasks. In your own crowded office - use it next to your desk and enjoy the extra work space. Additional recommended accessories include a pair of highly adjustable document display arms, and a pair of attachable zippered pouches - extra "onboard" storage for your mobile office work tools, project files, cables, and plugs. Size (open): 15" wide x 15"
Size (closed): 8" wide x 15"
Weight: 36 oz. (2.25 lbs). Durable non-glossy black plastic with silver-colored metal hardware. A carrying bag accessory for your mobile office desk keeps you organized, productive and looking good as you "office" on trips and in your daily work team meetings. Two generous handles are easy to grasp and comfortable to carry. Or transport your mobile gear hanging outside your rolling luggage, rolling computer case or luggage cart. It's also slim enough to pack and travel inside your luggage - where it protects your personal items as well as your desk and accessories. Wash it after every trip if you wish - to keep it germ and dirt free. It's already resistant to moisture and mildew. Size: 18 inches x 8.5 inches x 3.5 inches. The Document Display Accessory is a pair of highly positionable document displays, adjust easily to your best viewing distance and angle - sitting or standing. When not used or traveling, they fold down under the desktop, completely out of your way. Each display arm contains two locations where single sheets of paper or as many as 30+ sheets may be held for reading. All sizes fit; receipts and phone messages, reports and printout, journals, brochures, even sections of newspaper. Careful document positioning can also help you to keep your confidential papers and onscreen data visually private - especially in public spaces. Also, use this feature so that your documents face the best available lighting - and to control glare from excessive window or ceiling sources of illumination. This pair of document displays are a recommended accessory and come preinstalled when purchased with a desk. Black, non-glossy, durable plastic with silver-colored metal hardware. This pair of zippered storage pouches attach under both sides of your mobile office desk. They provide extra "onboard" room to carry your mobile tools and project files. Pouches attach inside the desk's frame, so they don't take up additional space. When you set your desk up for use, both pouches drop down to hang vertically on each side. This gives you easy visual and physical access when you need it. When you fold the desk up to travel, desk and pouches "nest" to become a single unit that's easy to pack and transport. Interior elastic loops are handy for holding individual tools, cables and other items. A separate interior sleeve holds your files and other papers. Pouches are moisture resistant and detachable for washing. Keep them germ and dirt free after every trip. This pair of zippered storage pouches are a recommended accessory and come preinstalled when purchased with a desk. Closure: Zipper on three sides. Size (open): 12 inches wide x 13 inches. Size (closed): 6 inches wide x 13 inches. Black, 600 denier polyester, PVC backing. Designed specifically for the 17" Apple PowerBook, the Flux is a sleek and sophisticated laptop case. With rigid, protective sides and 2" of bottom padding, it's the perfect case for your big PB. The case is sleek and sophisticated. With rigid, protective sides and 2" of bottom padding, it's the perfect compliment to your big PowerBook. When you want to travel fast and light, it can be used on its own. Or, use it with one of our packs for maximum versatility and protection. Now includes a large rear pocket and removable shoulder strap. Most "wet/dry", pouch-type screen cleaners contain 20-40% alcohol. Alcohol can permanently damage a your laptop's LCD screen. iKlear Screen Singles award winning formula is antistatic, nontoxic, environmentally safe and is the most recommended wet/dry pouch cleaner you can buy. iKlear Screen Singles are perfect for cleaning all laptop, pen-based, handheld, LCD desktop, panel & projection displays, desktop, touch screen and High Resolution Graphics Displays, CDs, CD-ROMS, laser discs, precision & multicoated optics. Singles are significantly more economical than "ordinary" wet/dry pouch-type cleaners. Each iKlear Screen "Single" can clean 5 to 10 desktop monitors or 25 laptop screens, CD's or DVDs. Singles are available from Other World Computing for $7.50 per pack. TiArmor is available for the front edge, wrist-rest area, and the top cover of your PowerBook. TiArmor for the PowerBook is specifically designed to protect the high-use areas of your PowerBook against scratches, oils, and dust. In addition to protecting the surface of your PowerBook, TiArmor provides enhanced comfort in a soft, yet rugged space-age material. Covers the entire top of the PowerBook (when closed), and the front edge where the original paint seems to flake off and most damage occurs. TiArmor for the iBook is specifically designed to protect the high-use areas in front of the keyboard and to either side of the trackpad. In addition to protecting the surface of your PowerBook, TiArmor provides enhanced comfort in a soft, yet rugged space-age material. Covers the areas to each side of the trackpad, providing comfort and protection. Prices from US$19.95 and $29.95. Griffin Technology Inc., innovator of exciting hardware and software products for the Mac and PC market, unveiled iFM this week, the world's first FM radio for the iPod. The Griffin iFM adds an FM radio to the iPod in one integrated sharp package that utilizes the iPod's own remote for its controls. Settings include room for six preset stations, station scan up or down, volume control and muting as well as manual tuning. Whether traveling or jogging around the block, the iFM gives iPod users the ability to check the news, weather or listen to their favorite radio programs - in addition to their collection of music in their iPod. The iFM works with all iPods and requires the iPod wired remote control that's included with all currently shipping 10 and 20 GB iPods. "The only thing missing from the near perfect iPod was a radio. The iFM adds this in a design that's so unique it has to be seen to be believed." said Paul Griffin, CEO Griffin Technology. "True, I have all the music I want in my iPod but if want to hear NPR or need a weather report its great to now have that option with my iPod and iFM." The iFM connects directly to the iPod via its headphone jack. It then incorporates a clever design that actually imbeds the iPod's remote into the case of the iFM itself. When inserted, the two separate pieces appear to become one complete unit. Headphones plug into the remote as usual. The difference is the iPod remote is now captured within the iFM. The tiny iFM attaches to almost anything via a belt clip on the back, similar yet more versatile than the iPod's own remote clip. Powered by the iPod, no batteries are ever necessary. Switched on, iFM disables the iPod's music and makes use of the remote's buttons for its own controls. Users interact with the radio via audio navigation. They can scan for available radio stations and save up to six presets that will kept in memory - even when iFM is disconnected and not in use. When iFM is switched off, the remote and the iPod return to their normal functions. The Griffin Technology iFM is priced $35 and will begin shipping in 8-12 weeks. WiebeTech has announced major capacity improvements to UltraGB, the highest capacity transportable bus-powered drive in the industry The UltraGB is now available in capacities to 250 GB. Formerly, the capacity limit was 120 GB. Prices are also reduced in 80 GB and 120 GB capacities. "UltraGB now supports drive capacities to 250 GB in both FireWire and USB 1.1/2.0 modes," said James Wiebe, CEO of WiebeTech LLC. "And unlike all other portable FireWire drives, this product offers sustained transfer rates of greater than 30 MB per second (in FireWire mode) combined with capacities greater than 80 GB. The fanless design makes it extraordinarily quiet. "This capacity increase was made possible through the use of an improved, ATA-6 compatible USB bridge combined with an ATA-6 compatible OXFW911 FireWire bridge," said Wiebe. "UltraGB is therefore plug and play under all recent OS releases, including Windows 98SE, ME, 2K, XP, Mac OS 9.1, 9.2 and OS X. The new high capacities, combined with the aluminum enclosure and fanless design of UltraGB, make UltraGB an excellent choice for noise conscious hard drive users who demand performance, connectivity and transportability." A copy of Mac Drive 5™ is included at no additional charge, representing a $59.95 value. UltraGB includes: Enclosure; vertical stand for desktop use, FireWire cable, USB cable and AC adapter. All drives are 7200 RPM. Bus power usage will work with any FireWire equipped desktop computer. The AC adapter provides compatibility with all other computers. Special: Get a Targus laptop bag for a penny; $59 value on a great bag with a lifetime warranty, only 1¢ with WallStreet purchase. These special offers are exclusively available to MacResQ Specials List subscribers (free). Please refer to your weekly specials email for the Q-Pon codes required to get these discounts and bonus offers. With a new or refurbished iBook from Power Max get a free Carrying Case, plus get the $30 256 MB "No Stinkin' Rebate" Power Max RAM deal, plus get Microsoft Office for only $199!